This was the one set I didn't have any trouble using when making samples. Not only do I love Christmas but cookie baking has been a tradition in my family for many years and it's one I've always shared with my son. For this set, I created a 12x12 page of our cookie baking tradition. 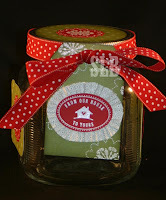 Because everyone needs a special container to put those cookies in, I decor ated this glass jar complete with a tagboard tag to match. I loved the way this gift idea turned out. What you don't see is that the cookie recipe is under the lid! I also created a recipe card holder and made a darling punch art gingerbread man to sit on the tag. Apparently someone at convention liked it as well as it was stolen off the display boards. It was so fun seeing all my samples on the boards. I would do it again if asked, it was an honor and a thrill! I'm currently on vacation in southern Utah and will have some fabulous pictures to share soon. We hiked in Capitol Reef National Park yesterday and although it was a pretty hard hike, it was so worth it. I was really glad it was in the 60's this morning when we started. It warmed up quickly to the 80's but there was a nice breeze and we had a fabulous day!